Y.CO and Captain David Farmery are hosting an Open Day aboard the 51m Alibi on July 11 in Nice, France, from 4pm to 7pm. Built by CBI Navi in 2005, Alibi can accommodate 12 guests and has plenty of space for outdoor activities. There is a panoramic open deck area with large half-moon-shape sunpads and an extendable table for 12 guests and a bar. Alibi’s vast sun deck was entirely refurbished with new furniture for Summer 2013. Alibi also features a gymnasium and a garage that holds a tender, three jet skis and more. Inside this superyacht are six cabins: a full-width master with an office and a Jacuzzi tub, two VIP cabins with Jacuzzi baths and two double and one twin guest cabin all with en suites. 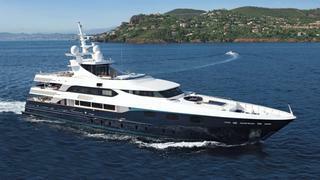 Alibi is asking €15.75 million.